The UK’s largest cruise ship designed for the British holiday market, Britannia, will sail into Greenock this week, as part a ‘lap of honour’ of the British Isles. The P&O Cruises ship which measures 330metres long (longer that the London’s Shard is tall) will arrive into Greenock on July 12th, carrying around 3,600 passengers. Her visit forms part of a 12 night cruise around the British Isles, including ports of call in Ireland, the Channel Islands and mainland UK. Britannia is a celebration of all things British and boasts the world’s largest Union Flag on her bow at 94 metres long. Other features of note include her contemporary elegant design and cutting edge art collection. Celebrity chefs James Martin and Mary Berry are currently on board, offering passengers the chance to take part in special dinners and masterclasses, as part of Britannia’s state of the art cookery school - The Cookery Club. Britannia’s arrival marks a record breaking year for Greenock Ocean Terminal, where she will berth for the day leaving the port at 5pm. In 2015 Greenock is set to become the first Scottish port to welcome more than 100,000 passengers a year. Breaking the 100,000 passenger ceiling represents a 14 per cent increase on 2014 and sees a total of 56 ships calling, including prestigious vessels such as the Queen Mary 2 which recently returned to the port as part of Cunard’s 175th anniversary celebrations. Greenock provides overseas visitors with the chance to see landmark attractions across Scotland. Many of Britannia’s passengers will take advantage of coach trips to other destinations, while many will spend time in the local area during their stay. 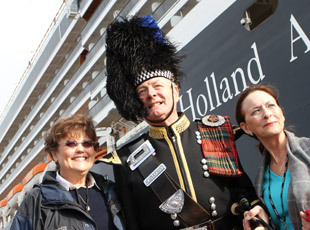 Owners of the terminal Peel Ports believes Britannia’s visit, marks a renaissance in the cruise market in Scotland, which is becoming a destination of choice for thousands of passengers every year. Greenock has been named as the number one port of choice for Americans visiting the UK, as part of a poll conducted by Cruise Critic, an online cruise guide where travellers share their experiences and opinions. If Greenock Cruise Terminal achieves its projected 108,866 visitors this year, it will bring an estimated £8.7million to the local economy. Andrew Hemphill, Peel Ports Director at Greenock Ocean Terminal, said: “Britannia’s visit comes during a landmark year for Greenock Ocean Terminal. We are witnessing a renaissance of the cruise market in Scotland where we are set to become the first Scottish port to handle 100,000 cruise passengers a year. “More and more cruise operators are choosing Greenock and the fact that we have just been named the UK port destination of choice by US tourists is testament to the continued investment Peel Ports has made in Greenock. “Investment has been crucial to the success of Greenock allowing us to create a welcoming and comfortable environment for passengers – the first experience thousands of overseas cruise passengers have of Scotland each year. “With its close proximity to some of Scotland’s most famous landmarks, as well as the beauty of the town itself, it’s no wonder Greenock is a popular choice.